Trying to find dinner options that are both delicious and easy to make can be a challenge for some. There are so many different options to choose from, that it is nice to have some variety. Making a pork roast may be just the thing you should try. The pork roast is actually taken from the loin area. It is center cut. It is known to hold its flavor and for being juicy. It’s not a complicated meal to make. You don’t need a chef’s license to make a fabulous pork roast. Just follow this easy recipe. Here is how you can make a pork roast. Read on for more information. Look at how large your pork roast is. Determine if you would be able to place the pork roast on a grill. If you have to sear the roast first in a frying pan, then you can do so. The pan has to be big enough to accommodate the roast. Rub the roast with some olive oil and season the pork with pepper and salt. Put the roast in the skillet over medium high heat. Brown the outer part of the roasts. This will seal the juices in. Put the roast in a pan.t. If there isn’t a pan big enough to brown the pork on the outside, there is an alternative. Rub the pork roast with olive oil, pepper and kosher salt. Put it in roaster. Preheat the oven to about 500 degrees if the pork roast is raw. Put it on 375 degrees if you took the time out to brown your roast before putting it in the oven. Place the pork roast in the pan inside the oven for about 10 minutes. Lower the temperature of the oven to 300 degree. Allow the pork roast to continue to cook for approximately 45 minutes. At this point, use the meat thermometer to check the internal temperature of the pork roast. 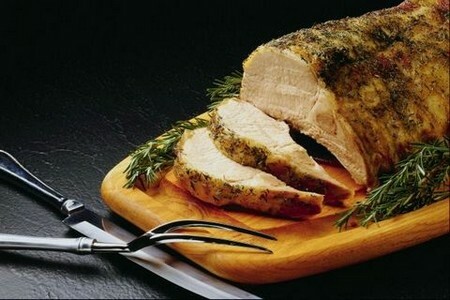 Remove the pork roast after the temperature has reached 155 degrees at the very center of the pork. 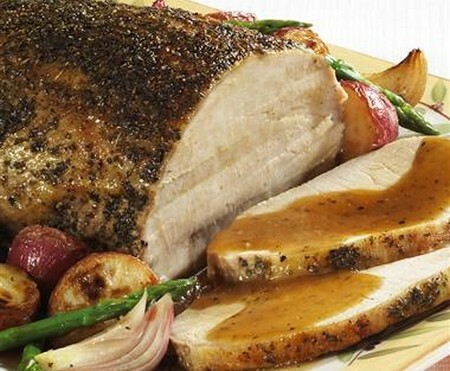 Take the pork roast from the oven. Let the meat rest for about 15 minutes. Do not touch or cut the meat during this time. This allows the juices to redistribute themselves inside the roast. Slice the roast and serve it with any sauce you desire. Eat while the meat is hot enjoy.